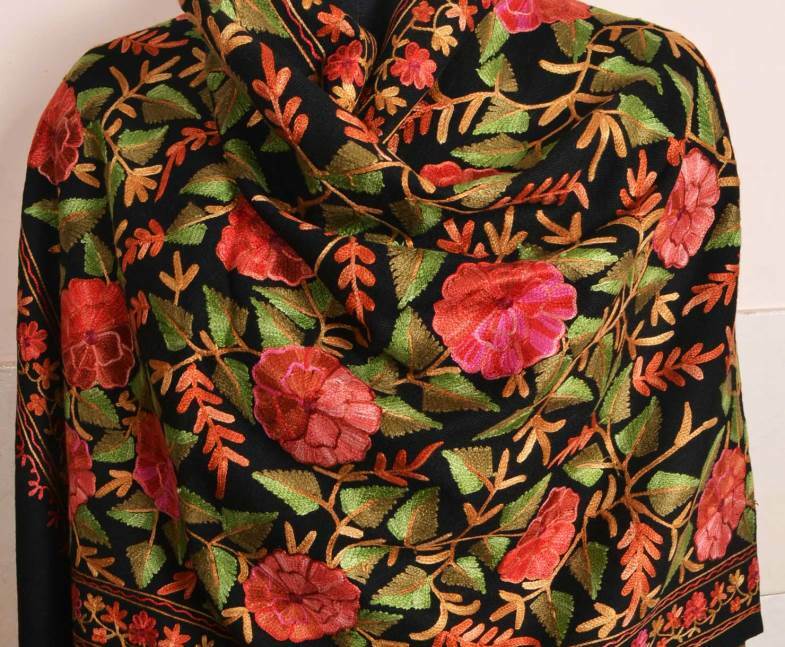 Crewel fabric is a hand-embroidered fabric traditionally made in Kashmir. A key characteristic of crewel work is the motifs do not cover the entire surface, and the background is not embroidered upon. 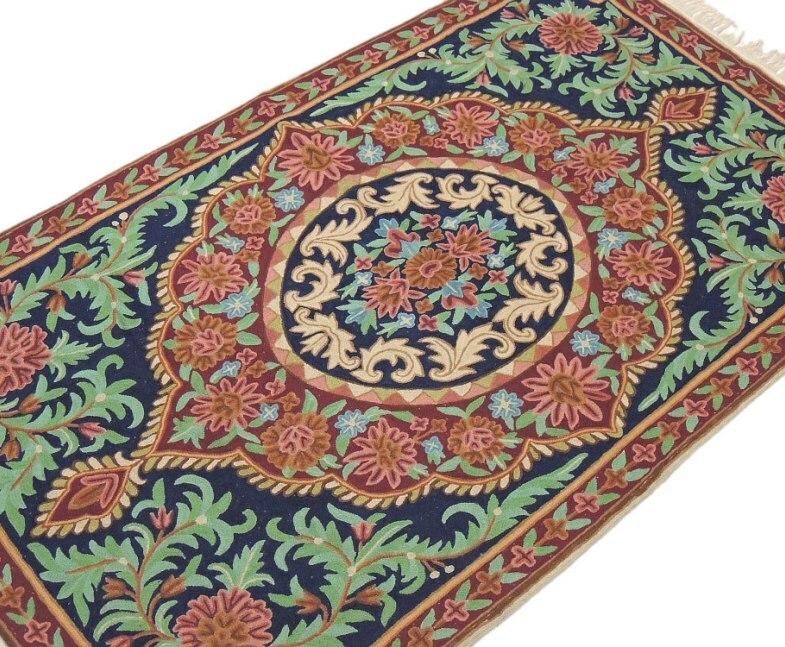 Crewel is done on thick material popularly used for furnishings and usually carries flowing floral and climbing designs. Crewel embroidery is done in thick wool yarn which provides a very dazzling and durable material for drapes and upholstery. Embroidery is hand done in either single or double ply wool. Items such as namdhas, purses and linens have crewel work designs. Crewel work with lighter yarn, even silk, is also used for shawls designs. Crewel embroidery is fascinating needle art. Typically done in thin wool thread on linen or cotton fabric, crewel work provides texture not seen in silk or cotton embroidery. A special kind of embroidery done with a pointed hook used for drapery and upholstery is known as crewel. 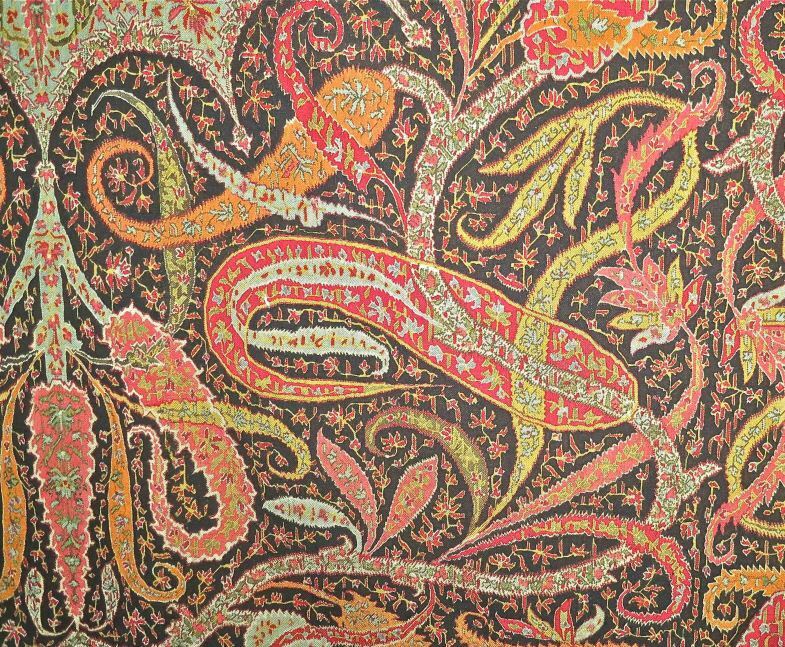 Because of the high quality of embroidery done on wall hangings and rugs, Kashmiri crewel-work is in great demand throughout the world. Crewel is basically similar to chain stitch. It is also chain stitch done on white background, but here the motifs, mainly stylized flowers, do not cover the entire surface, and the background is not embroidered upon Wool is almost invariably used in crewel-work and colour schemes are not as elaborate as in chain stitch. This fabric is available in bolts, and is sold by the length. They make excellent household furnishings, being washable both by hand or machine.All embroidery is hand done in either single or double ply wool. Crewel embroidery material is quite popular in export market as it satisfies the aesthetic expression lover of beauty all over the world. Besides these crewel products are very popular in domestic market also. Designs are available in assortment of colors ranging from a single color to multicolor embroidery. However, the designs and colors patterns can be altered as per order. The price is related with the amount of embroidery done on the material. The width of material is 52", 54" inches and length it comes in 25 or 29 meters, per roll. The craft is also available on Bedspreads, Cushion Covers, Throws, Shams, Curtain Drops, Duvets Covers in various sizes ranging from single to king size. We are sure to create a new World beauty in handicrafts and open new vistas in crewel embroidery fabrics given a chance.